What do you do when there are no borders? When the lines you thought existed simply vanish? How do you plant your feet to make a stand when you no longer know what side you're on? For over forty years, Art Keller has been on the front lines of America's longest conflict: the War on Drugs. His obsession to defeat the world's most powerful, wealthy, and lethal kingpin-the godfather of the Sinaloa Cartel, Adan Barrera-has left him bloody and scarred, cost him people he loves, even taken a piece of his soul. Now Keller is elevated to the highest ranks of the DEA, only to find that in destroying one monster, he has created thirty more that are wreaking even more chaos and suffering in his beloved Mexico. But not just there. Barrera's final legacy is the heroin epidemic scourging America. Throwing himself into the gap to stem the deadly flow, Keller finds himself surrounded by enemies-men that want to kill him, politicians that want to destroy him, and worse, the unimaginable-an incoming administration that's in bed with the very drug traffickers that Keller is trying to bring down. Art Keller is at war with not only the cartels, but with his own government. And the long fight has taught him more than he ever imagined. Now, he learns the final lesson-there are no borders. 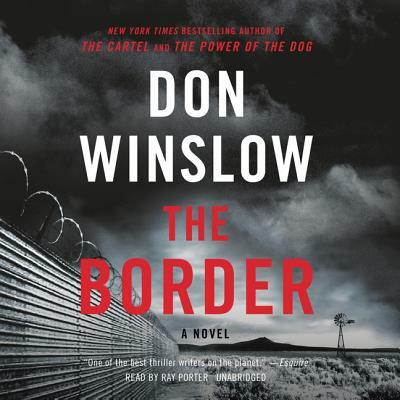 In a story that moves from deserts south of the border to Wall Street, from the slums of Guatemala to the marbled corridors of Washington, DC, Winslow follows a new generation of narcos, the cops that fight them, the street traffickers, the addicts, the politicians, money-launderers, real-estate moguls, and mere children fleeing the violence for the chance of a life in a new country. A shattering tale of vengeance, violence, corruption, and justice, this last novel in Don Winslow's magnificent, award-winning, internationally bestselling trilogy is packed with unforgettable, drawn-from-the-headlines scenes. Shocking in its brutality, raw in its humanity, The Border is an unflinching portrait of modern America, a story of-and for-our time.